I did a lot of job-y things this weekend. Saturday was so cold. I spent much of the day keeping warm and when I rallied in the afternoon, I spent it tracing patterns and cutting fabric (and cooking and cleaning and laundering and all the other things that go with Saturday). Yesterday, I was super organised. I got up early, went to Ikea and did grocery shopping before the rain started at lunchtime. I had been hoping to get some Christmassy biscuit cutters that are listed on the website but they’ve been out of stock for ages. I got a few other things, though, like these lights. We have a rope light that we put in the front window but it has slowly been breaking the last two years so I think we’ll retire it this year and replace them with these. Suction cups! Battery operated! I also got some other decorations and picture frames. When I got home, I took a student who’s preparing for auditions next week and after that, I was ready to sit down and be quiet. This is the result. Pattern: The by-now-quite-famous Renfrew top by Sewaholic. Fabric: About 1.75m of what seems to be a double knit. I bought it in April in Hickey’s in Galway; it was marked down from €20 a metre to about €8 so I bought 2m. I cut a size 6 and the finished garment measurement of 35″ bust was spot on. I tried it on before sewing on the cuffs and lower band and found that both sleeves and body were well long enough without them. What I did was overlock these edges, press them up about 3cm and stitch them down with my twin needle. I’ve heard all manner of horror stories of edges stretching out by using a twin needle but I had no problem here. I think maybe the structure of the fabric helped in this case. The only downside, to me, is how low the round neck is. If I were making the version without the cowl, I would definitely raise the neckline a good 10cm. The instructions are really clear and it came together very easily. I think it took me no less than 2 hours to sew. I should probably add that I was careful to use a ballpoint needle and take time to adjust the tension a bit on my sewing machine – it’s usually at ‘5’ and I turned it to about ‘8’. I just used my regular presser foot, too. Although it was really brilliant having the overlocker to finish things off, I see now that it is not totally essential for sewing knits. If I didn’t have an overlocker and I sewed my pieces together as usual and finished my edges by zigzagging them, it would be totally fine too. It helps that this fabric did not fray or shed one little bit while I was sewing it. Here’s how I’m wearing it today – with my grey wool dress from last year. I think there will definitely more versions in my future! I posted a while ago about a mock up I made of the Clover pants. They turned out really well and I ended up wearing them quite a lot during warmer weather. I went on to make two pairs. 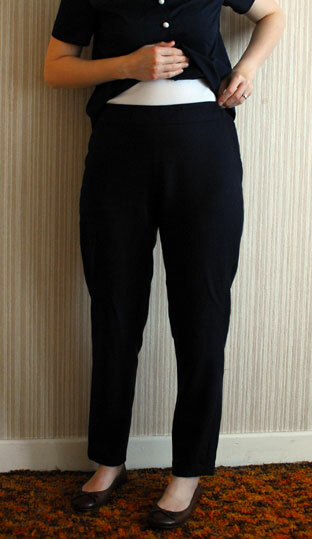 Here’s the first in a charcoal wool suiting. A quick recap! 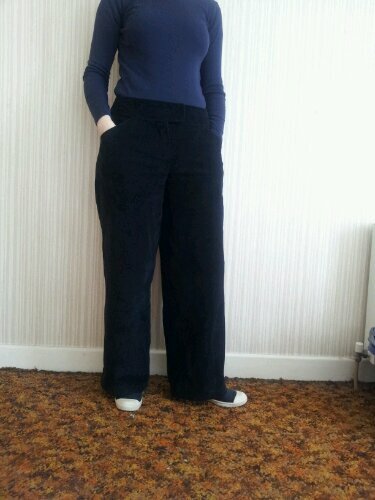 The pattern is the Clover pants from Colette and I cut a size 6 at the waist and tapered out to a size 8 at the hip. This made putting in the zip a little more tricky because of the curve but it turned out fine. I used not much more than 1m of the suiting. Luckily they required very little fitting – I took in the centre front seam a bit and let out the centre back seam about half an inch. They’re very comfortable. 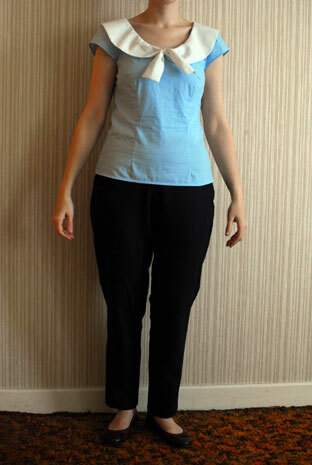 For a first pants pattern, they’re quick and easy and a great place to start. The other pair I made is in a navy wool cashmere. I squeezed this out of a metre and didn’t do anything different. It is impossible to see in the photo but the texture of this fabric is far more matt than the suiting, so it tends to pick up lots of hairs and bits of fluff. Again, it’s a really comfortable pair, quite snug and they go with everything the black pair don’t. My only qualm is that they leave my feet exposed so I’m limited to milder cycling days. Obviously I wear shoes! but these days, the weather has been more wool dress/tights/boots. I might as well continue with my unseasonal sew-and-tell. Contrary to the dress, I only finished up these two wee tops during the week. The first is my nemesis, the Violet blouse by Colette patterns. You might remember it from before. So many things went wrong for that blouse, I decided to give it another chance. Mostly, what irritates me about that blouse is that the collar doesn’t lie flat and doesn’t behave whatsoever underneath a cardigan or jumper. To be forewarned is to be forearmed so I went forth with my steam iron and interfacing. 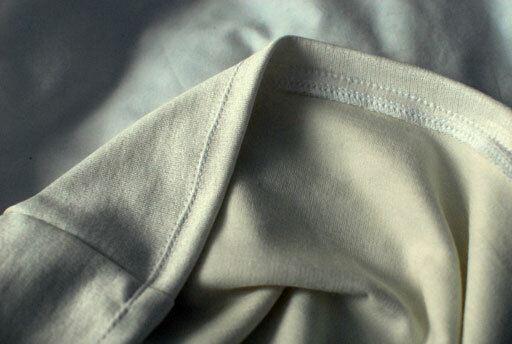 I used 1.5m of polyester/possibly polycotton of unknown origin and vintage and some leftover white cotton. It came together extremely quickly but that collar! It still won’t lie flat completely and there is no hope of enticing it to behave with a cardigan. Rather than be disappointed, which I am a little, I have decided to file this one away under learning about collars. For a start, the top is clearly designed to be worn without anything over it because moving your arms anything more than buttering some bread or stirring your tea causes the top part to move erratically. This does not help keep a collar in check. I had the same problem with the Jasmine top. I figured out in the course of my manipulations that the collar does not seem to have any allowance in it for the ‘roll’, meaning that it doesn’t overlap a neckband very well. And most importantly, I realised that the shape of one’s shoulders affects the lay of a collar such as this completely. In the modelled pictures, the model has much shoulder than I do. I have too much fabric in the collar at the front because of this. In an effort to solve this post-sewing, I pressed the collar into a position that folds that excess fabric away and then put tiny hand stitching in to keep its shape. It works well but still isn’t satisfactory with something over it. Oh well! The other top is a New Look pattern, number 6808. I have never sewn this brand of pattern before but Hickey’s has been running a huge sale for the last month so I picked up a few. I liked the look of this one because there are many options – 3/4 length, short sleeves or sleeveless; boatneck, boatneck with collar, scoop neck with collar and bow. 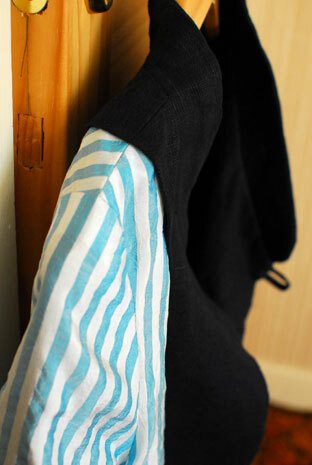 It seemed to be mix-and-match so I went for a scoop neck with the collar and short sleeves. The bow seems a little crazy there but I swear it is just the angle! I used 1.5m of polycotton and more leftover white cotton for the collar. This is mostly a wearable muslin: the polycotton was very cheap and the pattern is so basic that I figured if anything went wrong, I could probably salvage it and still wear it. I made a few changes. It’s supposed to have a side zipper but I didn’t bother and can fit it on over my head fine. The bust darts are a tiny bit long – nothing so bad that I really had to take them out but when I make it again, I’ll alter it. The pattern itself is very long, I had to lop about 15cm off the bottom of it. Next time, I will interface the facing as well. The collar is quite unwieldy and I had to battle with my facing to get it all to behave. Despite trying it on numerous times, I still wasn’t prepared for how low the neckline is and how gigantic the collar is. Again, it looks best without anything over it. So neither top is perfection but for the cost of them – probably €15 for both – I’m happy to keep them as holiday and entertaining clothes. Whilst I think the Violet pattern is done, I like the New Look one and will probably make a few more iterations, especially with the longer sleeves. It can be hard to find a pattern for tops for woven fabric that you can get into without a zip. 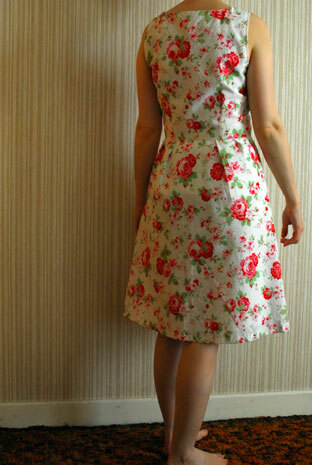 Pattern:Passport Dress and Jacket, Simplicity 2209 (Sew Lisette). Really, worth every penny. Perfectly pitched in terms of difficulty. There are a few things where you have to take your time but the nice details – like the darts in the bodice and the pleats in the skirt – are fun and easy to do. The jacket, too, is well laid out for someone like me, who’d never made one before. I noticed how only in the Simplicity book (the one you pick patterns from in the shop) are the Sew Lisette patterns listed as Petite. They definitely are: I’m very narrow-shouldered and love the patterns purely for the fit in this area. I didn’t have to make any adjustments. Fabric: 100% cotton from Ikea, about 1.5m. I used white bias binding around the armholes. So! The jacket! This was my first jacket but err… I didn’t even make a muslin. I did measure my pattern pieces very, very carefully though and was pretty confident about the size. Thankfully it turned out as intended. I bought a button for it. 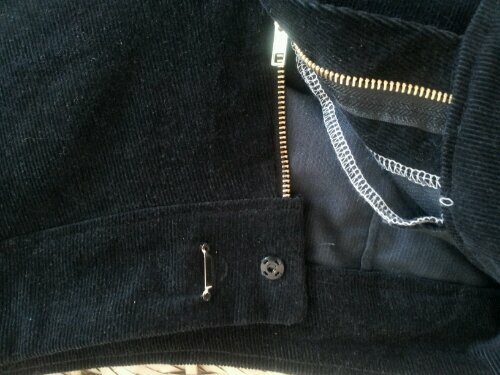 When I took out the jacket this morning, I realised I had never sewn it on. Figuring this was as good a time as any to sew it on, I went to locate it and then spent a good three-quarters of an hour searching. I still have no idea where it is which is why I am modelling with a pin through the buttonhole. Sigh! Fabric: 100% linen from Murphy Sheehy’s – I bought 2m hoping to eke out a little skirt to go with it but the panelling on the jacket took up the whole lot. I recall it being a good price, about €15/m. The lining is a seersucker polyacetate from The Cloth Shop and I have no idea what I paid for it, maybe something like €8/m. So, a little on the expensive end but a nice dressy, light jacket is hard to find. As I said, I didn’t have to make any adjustments to the fit. The collar took patient basting and stitching but it came together well. I’m glad I interfaced where the pattern said to because it gives the front really good structure, especially with the linen. The instructions do not including how to line the jacket so I basically made it up as I went along. I know there are lots of good tutorials out there but I didn’t get around to looking at even one of them! It was pretty straight-forward, actually. I just cut the pattern out again and sewed the facings on to it before I attached the facings to the body. The instructions do include how to finish off the insides for leaving it unlined which is nice to have should I want to make another. I could see myself making another to go with an outfit for a certain occasion, something I would only occasionally wear, in which case it probably wouldn’t be worth lining. This one, I think I will definitely wear a lot. Overall, I think it’s a nice outfit and the jacket will work with lots of other clothes I have. 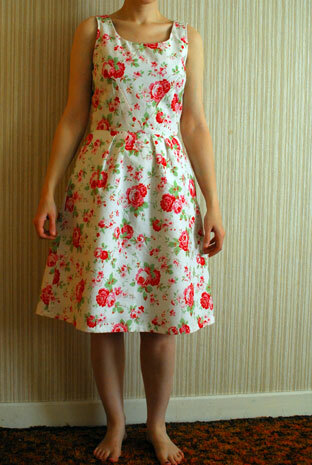 The pattern is really straight forward and if you have never made a dress or a jacket, would be a good place to start. For some reason, I find myself extremely amused by this project. Every time I pull them on, I snicker. Maybe it was that I wasn’t quite so prepared for how…wide they were going to be. I shouldn’t have been – I made a muslin and was really happy with it. 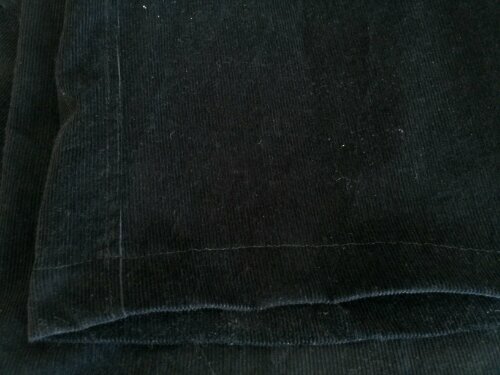 Fabric: Black cord with lovely weight and density of nap, marked down to clear at Hickey’s for €6/m. I used barely over a metre so I have enough left over to make something else, too. As I said, I made a muslin in the size 6 and made no adjustments at all. The fit around the waist and hips is great. This was my first time fitting a fly zip but the instructions were very clear and it was easy. The pockets, too, are awesome. Deep and comfortable without being bulky. Really, my only thing with the pattern us the width of the legs. They’re like boat sails. I feel certain I have added momentum on a windy day, wherever I go. I think alot if this is due to the stiffness of the cord; in a drapier fabric, I imagine they would be quite luxurious looking. In fact, I cannot conceive of a summer pants more comfortable than a pair in light cotton or even silk. Sometimes, I think that should take the legs in. Others, I think I like their bold, wide statement and that they should stay as they are. For the moment, I’m going to leave them as they are and see how much I wear them. I did make them as comfy-at-home pants. Here’s a look at the fly detail. I used a snap and a hook instead of two hooks because 1. I only had one hook and 2. Even if I did have another, they wouldn’t have fit together. This works fine. Have I mentioned how much I love my overlocker? The fraying and sheer disintegration of cord seams drives me to distraction so I was thrilled to have a solution! I serged the side seams then stitched them down; it’s a nice finish. As for the hem, I shortened the bit that goes over my shoe ever so slightly so that they don’t wrinkle over my shoes. It was an experiment and I have to say, it works pretty well. The jury’s out regarding the legs but today, I like them.